We’re glad to extend our template section with new name - AcyMailing As you know, RoundTheme is a template provider for 3rd party Joomla extensions and now it’s time to add new stuff. AcyMailing is considered as the most popular Joomla! extension for E-mail marketing. If you want to organise newsletters, this extension is the best. Professional looking newsletters gives a great effect: Content with neat appearance can be perceived better since it shows the style. The company which pays attention to the design looks more awesome, as a result, you’ll get better conversion rate or get more attention. 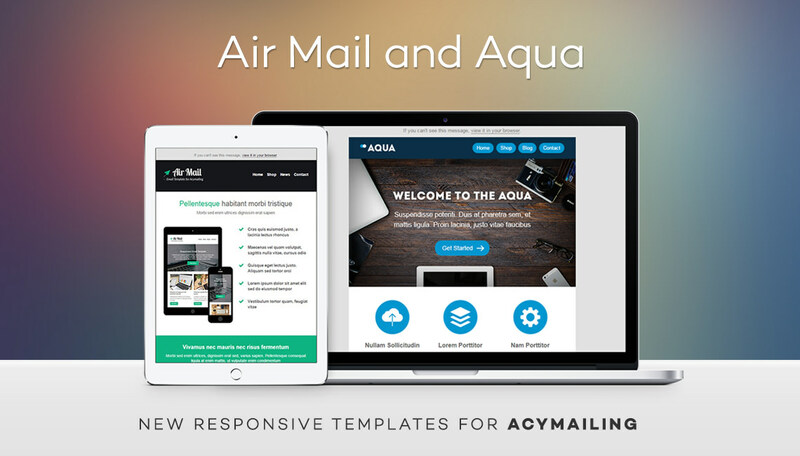 Now two pilot templates have released: RND Air Mail and RND Aqua. Both templates are responsive and universal as well as ready to use on different areas and fully compatible with modern gadgets and e-mail software (Mail, Outlook Express, The Bat). RND Air Mail is perfect for special promotion, digest, latest news and etc. and made in flat design with active green-diamond color. RND Aqua have contrasting color combinations and is best for service providers and sites selling subscription. Both templates comes with PSD source and graphic packs, so advanced user can customise template according to their requirements.